One of the best hostels we stayed during 1 month of traveling through Colombia. The rooms are a little bit small but the beds are comfy and you have an own bathroom. Breakfast is yummy, you can chose between granola and eggs, but the portions could be bigger. The atmosphere is great and you can easily get in touch with people from all over the world here. I had an excellent stay at Republica. Once you've been there, you will always come back, or never leave #WillyWonka :P. Very good for people, who travel alone. Great atmosphere and great employees! They help where they can and you will have lots of fun with them #Dany #Douglas!!! Definitively recommend it! Bring your own locket. Great hostel, very clean and in a good area. Staff is really nice. The breakfast is ok but not too much. Very fast internet and good chill out area. Would def recommend! 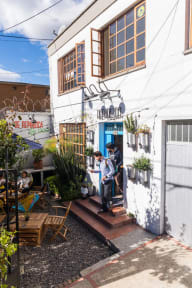 One of my favorite hostels for Bogotá! Good breakfast, awesome WiFi (20 mbits down/8 mbits upload), nice atmosphere and they also manage to host latino backpackers. Plugs are kinda rare and the walls are a bit thin, however, it is not a party hostel and it doesn't get too noisy for my taste. If you want it super quite or this one is full, go to "Mi llave" which is just a few blocks away and same quality! I highly recommend to stay here! Nica place, friendly staff. A bit farm from the center. + friendly and helpful staff + well equipped kitchen + nice atmosphere - Dorms and the bathroom are too small. A place to change for the shower is missing. Ab auch ein tolles Hotel mit viel Aktion! Leider hatte unser Bad sehr viel Schimmel und es war nicht so sauber. Bett war super und Frühstück war auch entspannt. Ab auch ein guter Übergang in Bogota für weitere Wege.